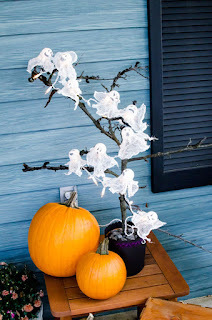 Use clips to suspend ghoulish artwork from curtain rods. We used medical textbook clip-art images to get the look, enlarging them to fit on 11x17-inch sheets of paper. 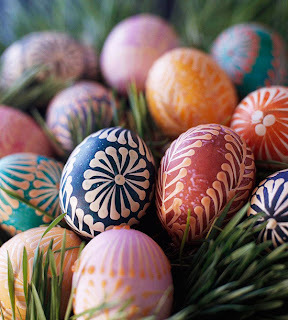 Dip each print in a tub of diluted coffee (for color) and let dry. 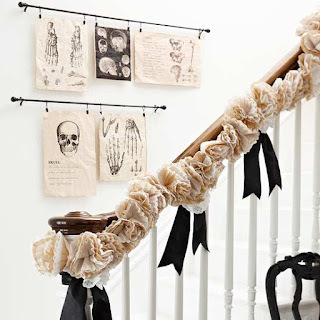 Embellish railings with garlands crafted from layered 4- and 8-inch doilies and coffee filters. Bundle a few together, pinch into a flower shape, and tie with wire. Wire the bunches to a long ribbon. 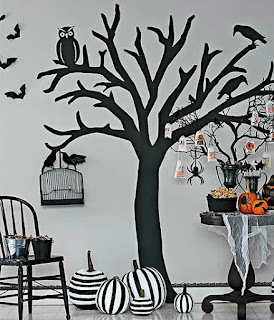 Make the Halloween craft: Begin by laying sheets of black construction paper side-by-side on the floor until you have enough to create the size of tree you want to make. 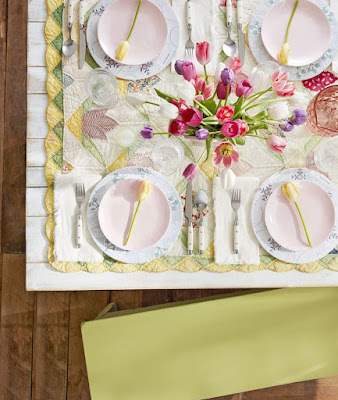 Create a tree trunk and branch pattern atop the construction paper, and cut out. Flip the pieces over, and tape their seams together with black masking tape. Use hanging strips to mount the tree to a wall. Trace and cut out patterns for the crow, owl, and spider. Trace the owl's eyebrows, eyes, beak, wings, and other details onto the back of a piece of glitter paper. 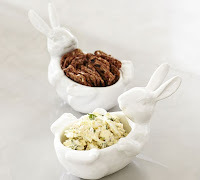 Cut those pieces out and use a glue stick to attach them to the owl. Position the animal patterns on the tree using hanging strips. 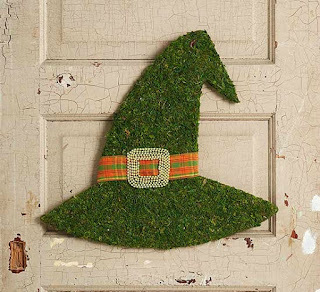 Make the Halloween craft: Trace a witch's hat pattern onto a piece of lightweight wood, and cut out the pattern with a jigsaw or fine handsaw. Sand the wood to smooth any rough edges, and then adhere preserved moss to the entire wood hat using hot glue. Position a piece of festive ribbon just above the brim of the hat and secure the ends of the ribbon to the back of the hat with hot glue. Create a square buckle using different ribbon or decorative beads and glue it onto the plaid ribbon. 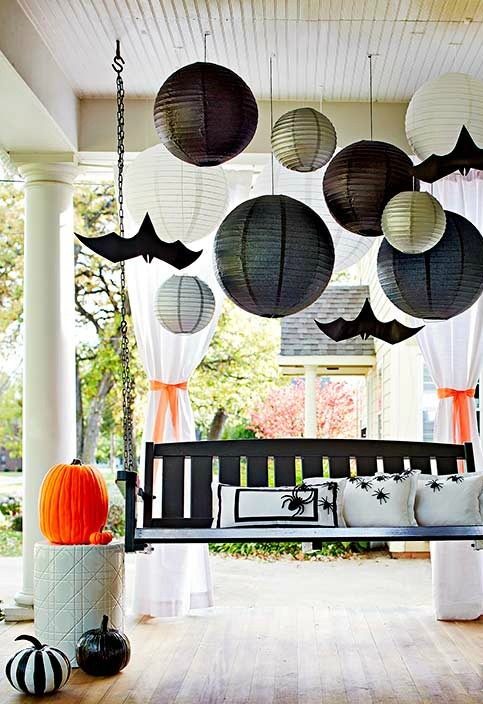 Make the Halloween craft: Paper lanterns -- black, silver, and white -- hung at alternating heights offer visual interest and a backdrop to a few "sleeping" cut-out paper bats. Plastic spiders scatter across a trio of simple pillows with the aid of hot glue. 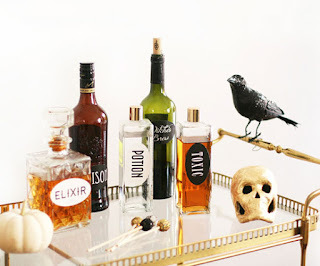 Pull out an assortment of glass decanters and bottles from the pantry (or head to your nearest thrift store to stock up) and spend the afternoon putting together a collection of eerie potions and elixirs fit for Halloween. We printed a few words onto sticker paper, but you also could handwrite on labels. 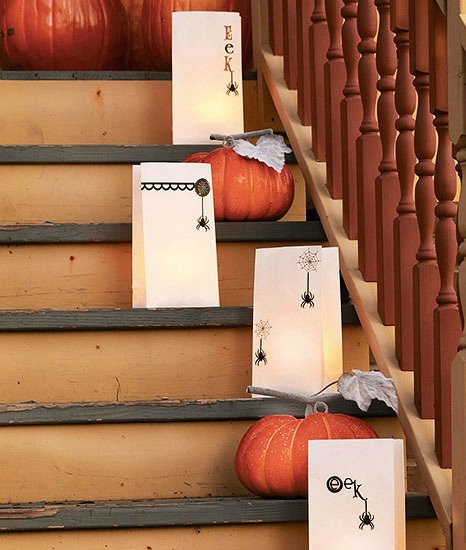 Make the Halloween craft: Decorate white paper bags with spider rub-ons, stickers, or trims. 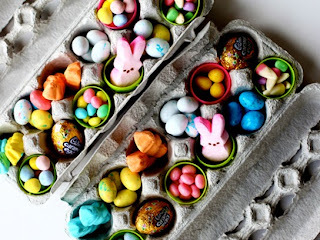 Fill the bottoms of the bags with sand, and place them on stairs or along a walkway. Rather than real candles, we used battery-operated votive candles for safety. Push the candles into the sand for stability. 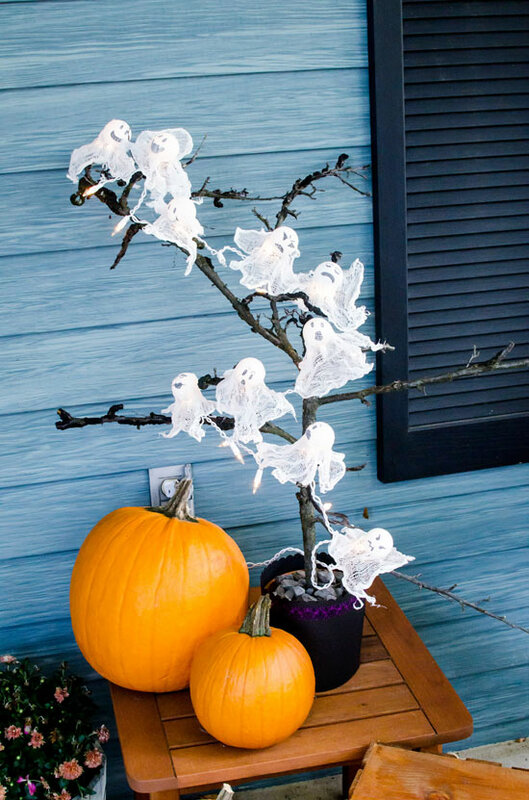 Repurpose white Christmas tree lights with this clever Halloween-theme project. 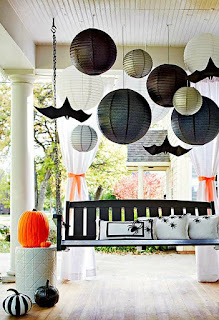 Use a permanent market to add ghoulish faces to plain table tennis balls, then cut a hole into each one to fit over the bulbs. Next, cut cheesecloth into squares, dip in diluted Mod Podge, and drape over the balls. Let dry before assembling and lighting. 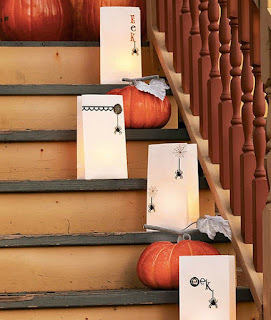 Make the Halloween craft: Remove and discard the glass from the frame; insert a piece of web-pattern paper cut to size. 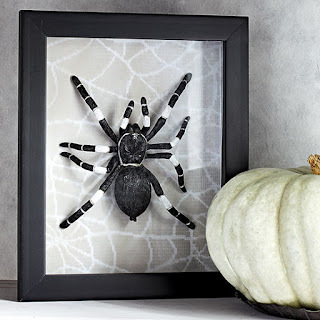 Using crafts glue, add decorative stripes on an oversize plastic spider. Attach to the paper with a dab of hot glue. 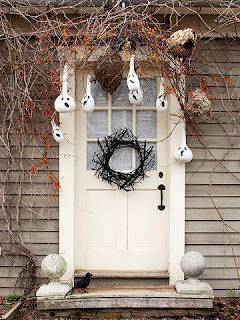 Since white objects are highlighted at night, ghostly door decorations made from painted gourds are sure to catch the eye and chill the heart in the dark. Use black paint to give the apparitions spirited expressions; dangle the phantoms from dormant vines, porch rafters, or tree branches. Embellish your exhibit with dried bittersweet, abandoned paper-wasp nests, and a painted twig wreath. 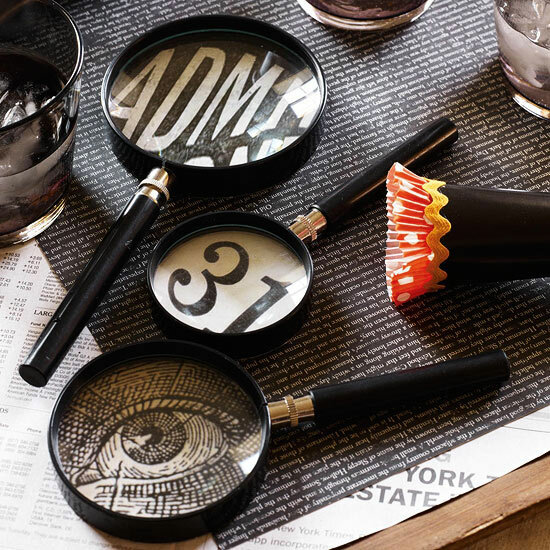 Make the Halloween craft: Adhere our downloadable vintage images to magnifying glasses. 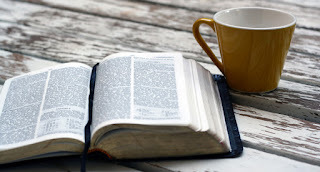 Place the magnifying glasses on a newspaper or book page for a more believable trick.